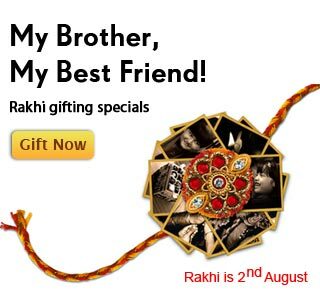 Gifting and beyond this Rakhi! Rakhi is always a special occasion, not only does it strengthen the bond between brother and sister, it’s also a special time for families to come together. In the spirit of this festive occasion, we bring to you an easy way to select gifts for your loved ones this Rakhi. You can also make this a special time to plan a trip with your loved ones or even pamper them at a spa. We have a variety of gifts which can personalized to your recipient and include a favourite memory of the two of you. Thus, Rakhi is not so much about gifting as it is about the ties that bind us and the bonds that need to be celebrated. Try something new this year, make a new gifting pledge to move out of your comfort zone and take your gifting to the next level. Need ideas? our customer service team is always eager to help you out. For any feedback you may have of our collection or service, you can even write into me personally at jemima.desouza@grg.com. Till then, do shop the collection and have a blessed Rakhi!